Such beautiful love…to such tragic ending. Never seizes to amaze me. Do you wonder if she sent him a letter asking him why he didn’t come to her when she was ill? He seems to be addressing her “unreasonable thoughts”. Also, Claire, I wonder if you subscribe to the theory, that after Henry had a bad fall, he suffered from mental illness caused by the damage done by the fall. Maybe that’s why he was so easily swayed. 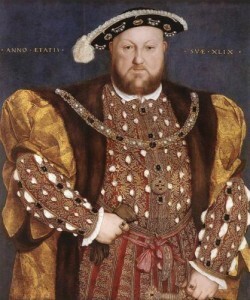 Henry did not have his “bad fall” well into his marriage with Anne and while she was carrying his second child, a son, which she miscarried several days later. The King had to be taken to safety, away from the “Sweating Sickness” that was sweeping through the land. He was being held in quarantine and therefore could not be with Anne, who was in fact suffering from the sickness herself. How can not ones Heart melt at the words of the worlds most notorious monarch! I’m blown away. well, MY heart does not melt because he did not really mean these sweet things. He was probably excited because she kept aloof from him and males do love the hunt. You notice that once he obtained her, (after a brief “honeymoon” period) he turned on her like a vicious maniac and had her slaughtered, after butchering her friends and family members. And this he did to his “beloved” — to the mother of his child. No, my heart is NOT melting. Henry was a psycho who should have been locked in the tower for everyone ELSE’S safety. Just sayin.